Despite STILL being ill, I battled in to work today because, to be honest with you I look forward to my job! Today my task was to photograph the warm, winter coats for their facebook fan page because it's really cold in England at the moment - no sign of snow where I am yet though. 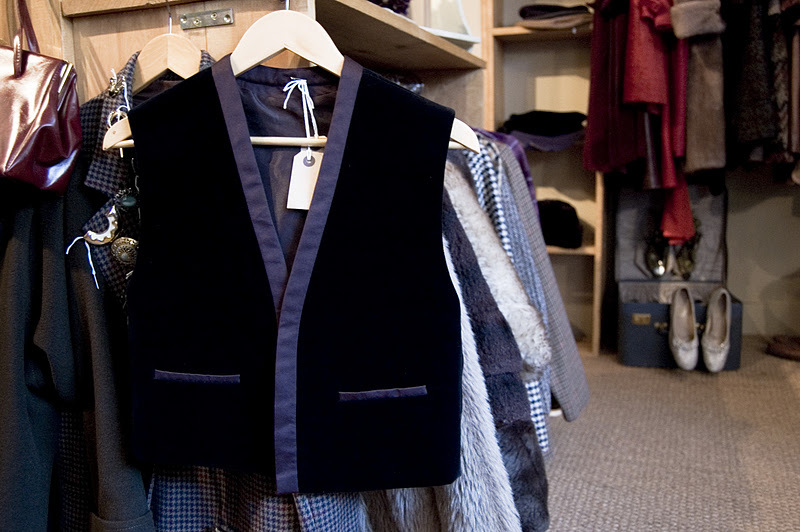 As a thank you for setting up their new facebook page and twitter account, my boss told me to choose something to take home with me and I chose an adorable little black velvet waistcoat, as shown above, which I've had my eye on for so long now! I'm not quite sure when I'm going to wear it yet, maybe with a long sleeved dress...but any way it will work wonders for a Peter Rabbit themed shoot I have coming up! 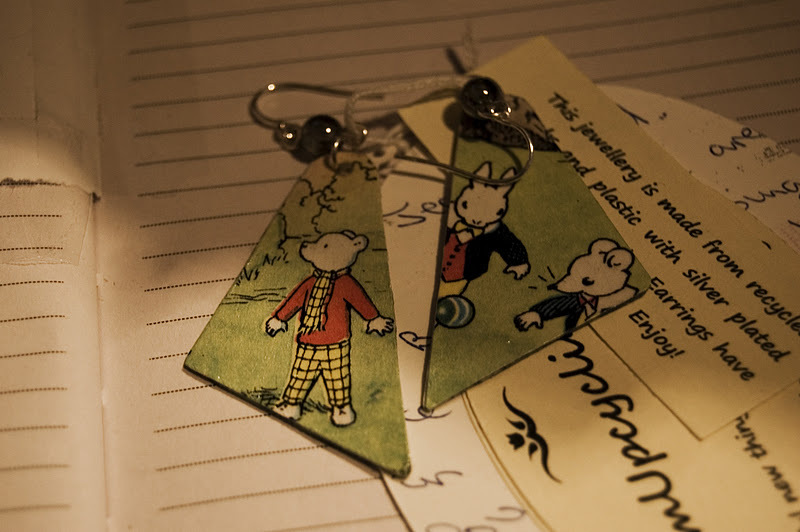 These earrings were new to the store and made by GlamUpcycling out of old, damaged children's books! They were only £6 and as soon as I saw them I knew I had to have a pair, they're so kitsch and have that 80's triangular shape that makes them so special, I love them! I've also had also had my eye on this beauty for such a long time - since I started working at Charming Magpies actually! I couldn't justify buying it because it's a little dainty for my usual taste, but I kept thinking about it and when I showed my Mum a picture she said she'd buy it for me cos it's so gorgeous! 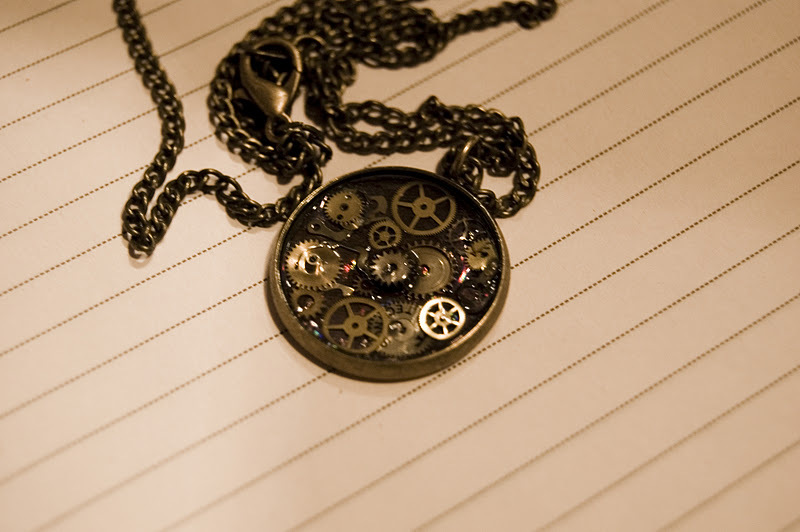 Ah, love my Mum:) It's made out of old watch parts, how clever! The photo doesn't really do it justice, as when it catches the light it sparkles all different colours making it so beautiful I could look at it for hours! You can find more of their pieces HERE. The earrings are so so cute! Love that vest! Am interested to see how you will style it. I'm sure it will look terrific as do all of your outfits.